For prices, terms, warrantee click here. Profesor Bubbles invented this professional bubble machine for use in his internationally acclaimed act. It is a well made, stage-quality product, perfect for shows, grand openings or other special events. 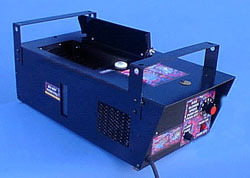 This machine produces an absolutely incredible effect! The machine produces up to 25,000 bubbles per minute! Featuring an adjustable air intake for control of bubble quantity, an adjustable baffle for directing bubble flow, a blower rheostat for distance control, UL approved parts and brackets for wall or ceiling mounting. Discounts for purchases of multiple machines.